Much has happened to Ari Taymor and his team since my last visit to Alma back in December 2012. 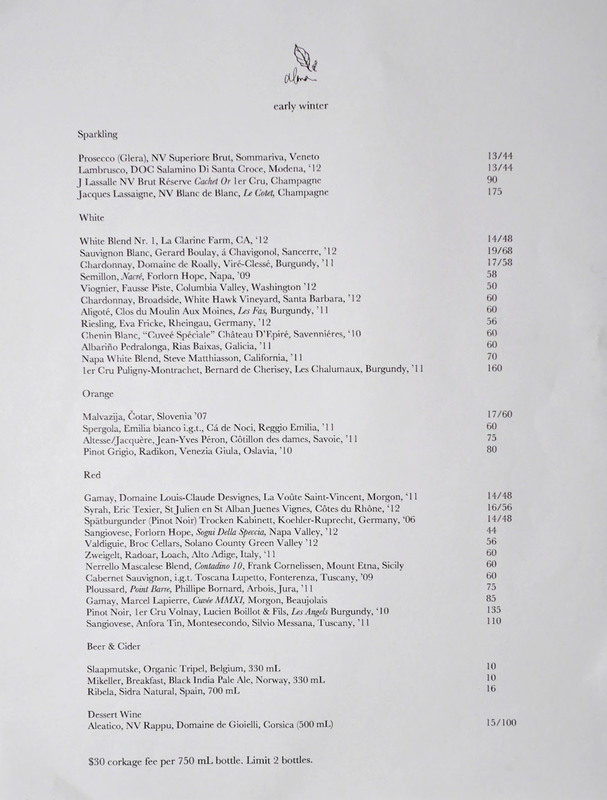 LA Magazine named the place one of the Top 10 Best New Restaurants of the year, and in February, it finally received its long-awaited beer and wine license. 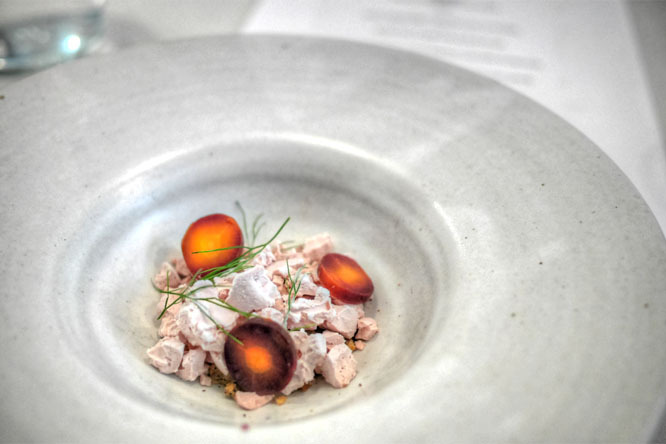 This was followed up by a three-star review from LA Weekly and a partnership with Venice gardener Courtney Guerra (ex-Meadowood) to supply the restaurant with locally-grown produce (and yes, they're still working on that rooftop garden). On the personnel front, Chef de Cuisine Brian Maynard (Melisse) replaced Danny Romo, former Beverage Director Chris Yamashiro parted ways, and there's still no pastry chef. Ashleigh Parsons, however, is still running the FOH, as well as heading up the successful Community Outreach Program. 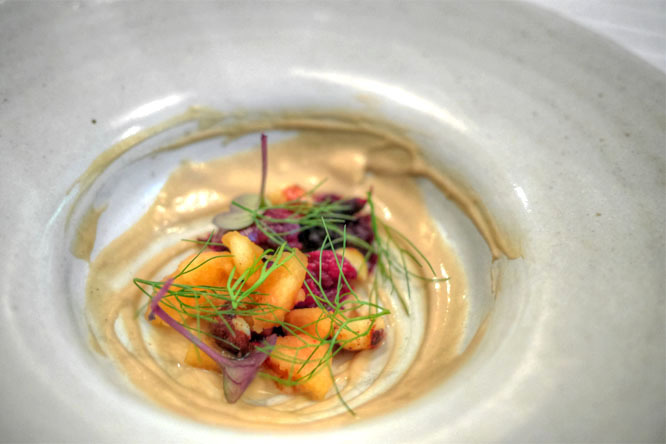 The biggest news of the year, though, was Alma's securing of the #1 spot on Bon Appétit's 10 Best New Restaurants list in August. 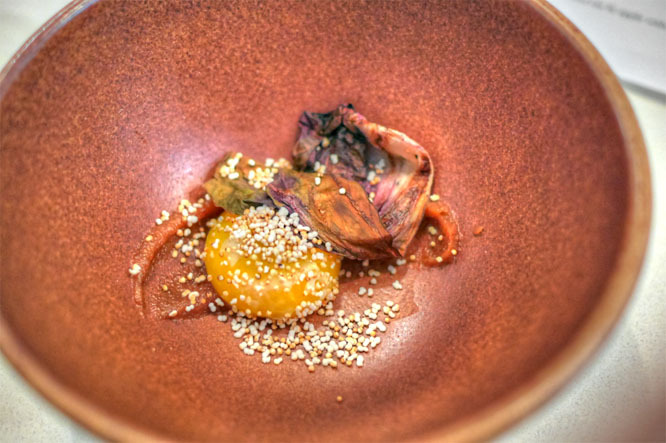 This was the win that made the restaurant part of the national culinary conversation, and one of the most sought after reservations in Los Angeles. Taymor and company have finally arrived; now what? 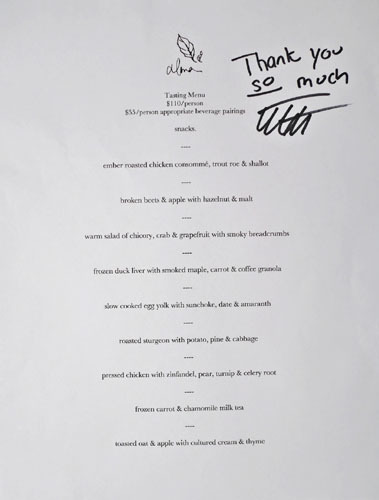 Well, for starters, Alma switched to a prix fixe-only menu format at the end of November, a move that I'd been wanting to see for a while. 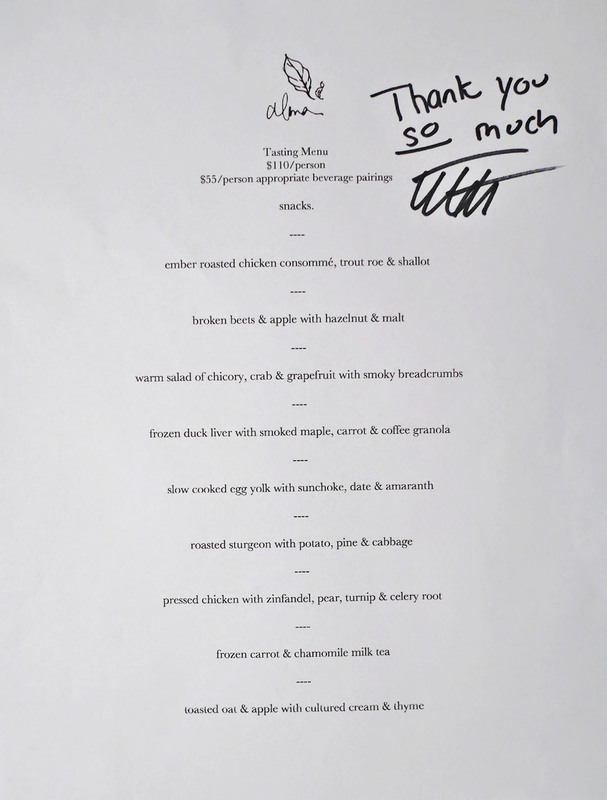 Diners are presented with a choice between a five-courser at $65 and a longer, roughly nine-course tasting menu at $110, plus $55 for beverage pairing. 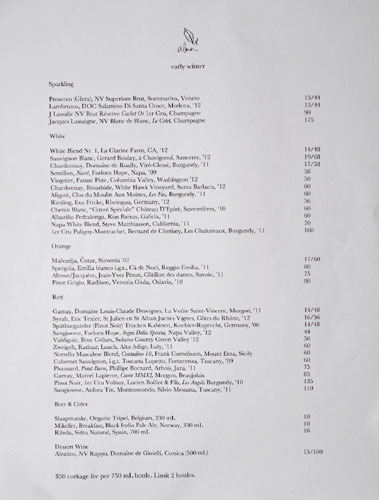 Also to drink, you'll now find a compact wine list focused on organic/biodynamic selections, two beers (I'd really like to see more), and one cider. Corkage, meanwhile, is $30, with a limit of two bottles. Click for larger versions. 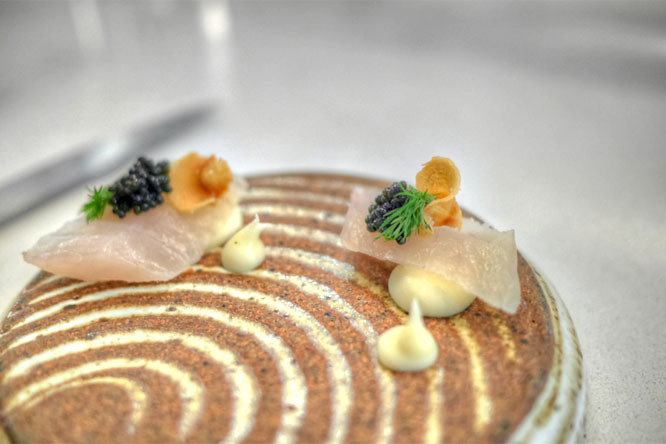 Instead of amuse bouches, you get "snacks" at Alma, the first of which brought us smoked sturgeon with parsnip pureé, parsnip chip, and caviar. They were tasty little bites, the sweetness of the root veggie playing off of the smoky, salty fish while the parsnip crisp added a nice textural jolt. A promising start. 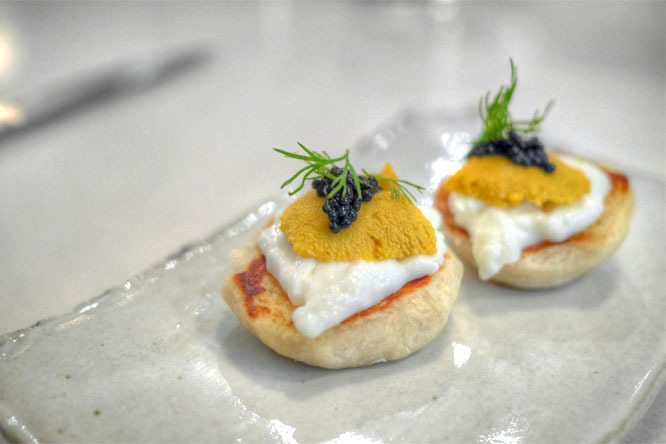 Even better were the English muffins with burrata, uni, caviar, and dill. Think a bevy of lush, creamy, salty flavors, all perfectly harmonized and accented by a touch of anise while the muffin gave up a familiar, home-y sort of sensation that made us think of Thomas'. Excellent--I could've used several more of these. Here we come to Taymor's signature starter: seaweed-tofu beignets with yuzukosho-lime. 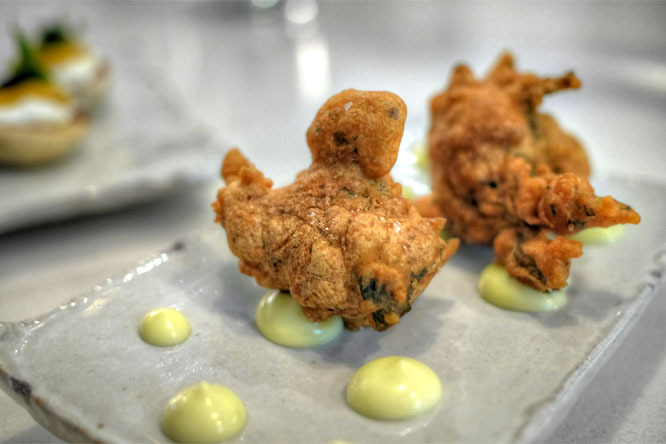 The fritters were a lovely blend of savory, sweet, and salty, loaded with a touch of brine toward the finish and a great pair to the tartness of the accompanying condiment. I've had these a couple times prior, but this time around they just seemed more inspired, more exacting than before, much like the rest of the food. 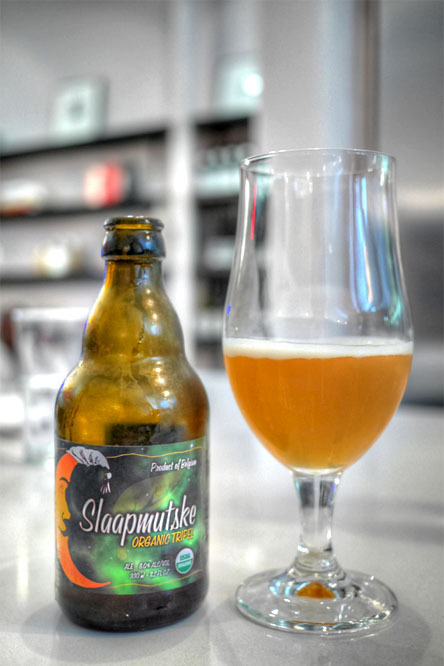 I ordered one of the two beers available, the Slaapmutske, Organic Tripel, Belgium [$10]. This one went surprisingly fruity on the nose, and that sensation continued on to the tongue, joined by a pleasant yeastiness and quite a bit of malty caramel. Still pretty crisp though, with a bit of underlying booziness. 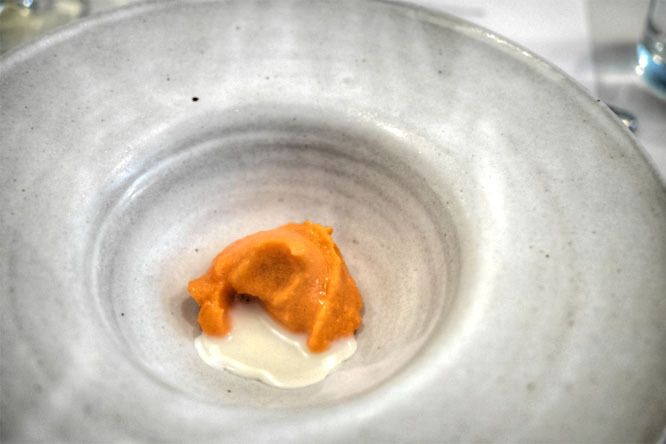 Our first proper course represented quite possibly the cleverest use of chicken skin I've seen, its unbridled saltiness becoming clearer and clearer the more you processed it on the palate, stealing attention away from the combo of consommé and roe while the shallot moderated the entire interaction. Hot on the heels of another strong beet course I'd had the previous night at Taco Maria was this beauty. Again, the key was how the sugariness of the beet was balanced, this time by the presence of malted crème fraîche, while the brown butter hazelnuts imparted a nutty, caramel-y crunch to things. I quite enjoyed this with the Zweigelt too, as it tended to temper the strong melon-y notes in the wine. Again, another very thoughtful, structured course. 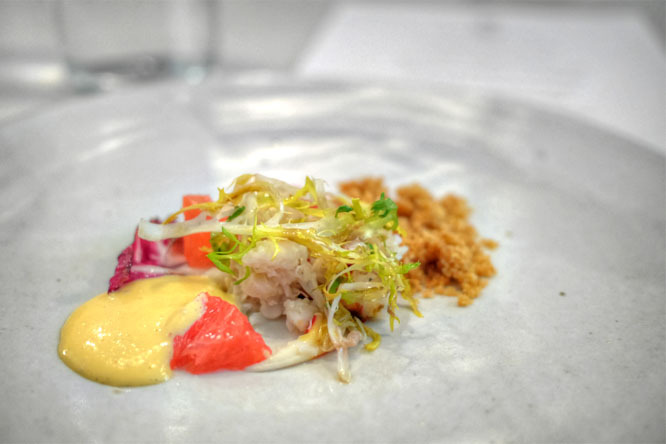 There was sort of a lot going on, but I appreciated how the crab was always the hero, caught between contrasting forces of earthy breadcrumbs and tart, tangy citrus and Hollandaise. Great wine pairing here too, with the accompany Sauv Blanc conveying an almost shellfish-esque nose but also a surprising amount of fruit when tasted. 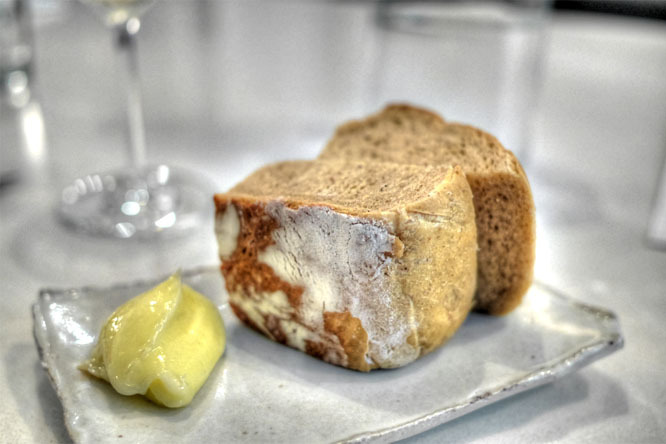 I was a bit blown away by Taymor's homemade bread during my last visit, and he continued to impress with this beer-rye specimen, a nutty, smoky bread that went gorgeously with the dollop of slick cultured butter to its side. Next was undoubtedly one of the best preparations of duck liver (foie gras?) I've tasted. 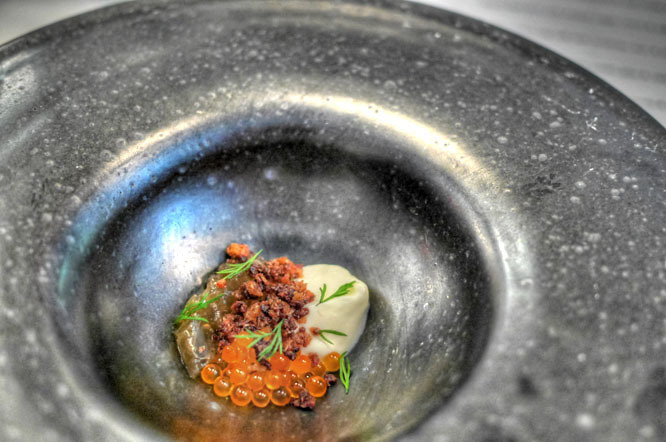 The key was how the liver was frozen with liquid nitrogen, thus appearing crunchy and subtle at first, but growing in intensity as it melted, its offal-y goodness commingling with the bitter, nutty granola and licorice-tinged fennel in flawless fashion. Definitely some wow factor on this one. 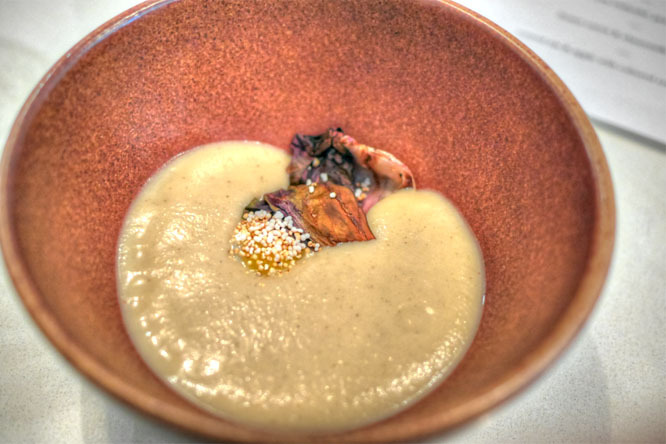 A potage of sunchoke tasted of the season, its inherent sweetness melding with the lushness of the egg to form a hearty, comforting dish, though I would've liked to have seen more from the amaranth to offset the weight of the soup. 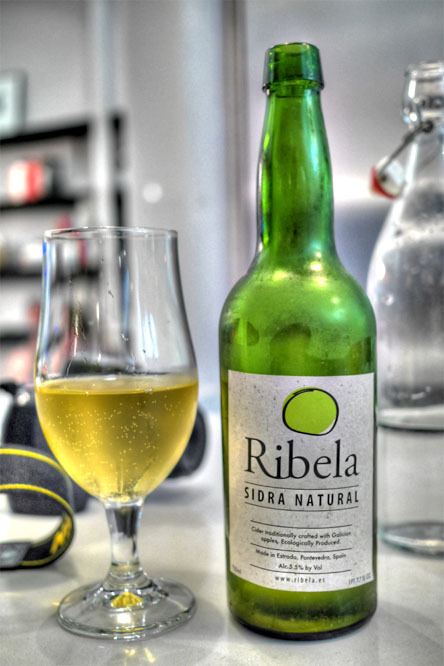 With the beer gone, we opted for a bottle of the Ribela, Sidra Natural, Spain [$16], a dry, tart, funky cider (just how I like it) that really hit the spot. 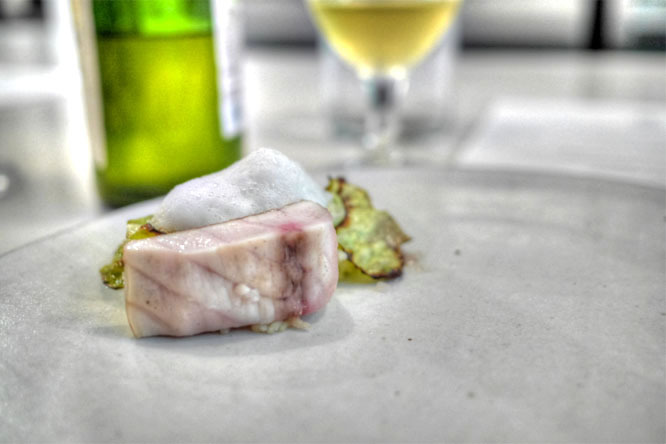 The sturgeon was a winner, the fish roasted in cabbage and coming out firm and slightly rare, its salinity on vibrant display, yet evened out by the bright, bitter veggies and pine foam, all while the potato grounded the course. Very good when taken with the paired wine as well, which had a cider-like, almost oxidized quality to it. Our last savory of the night brought us both light- and dark-meat chicken, pressed together and sous vide'd. 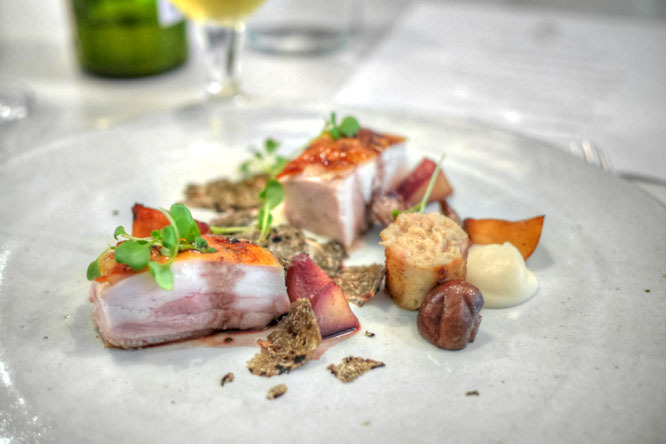 The end result was a tender, moist bird, brimming with classic roast chicken flavor yet enrobed in the earthiness of Oregon black truffle, with the root vegetables offering up a bitter, crunchy contrast to the meat. A satisfying conclusion. 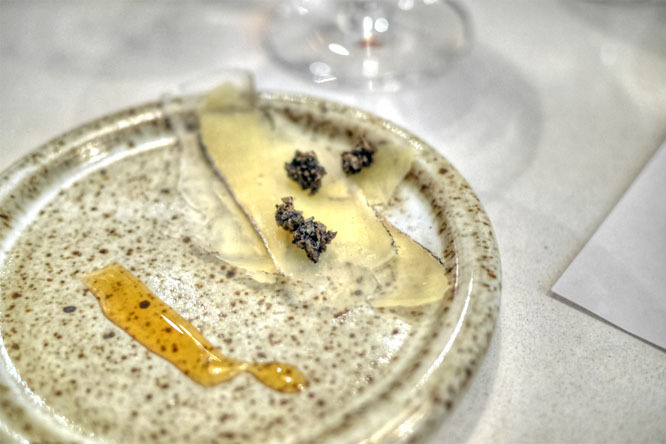 Fromage comprised slivers of Tomme, accompanied by truffle and black honey, an effective, yet lighthearted combination that really showed off the interplay between sweet and salty over a base of the cheese. An intermezzo. Frozen carrot tasted remarkably true-to-life, like a concentrated blast of carrot-y sweetness that was somewhat jarring alone, but wisely softened by the floral qualities of the chamomile. Now, dessert proper. 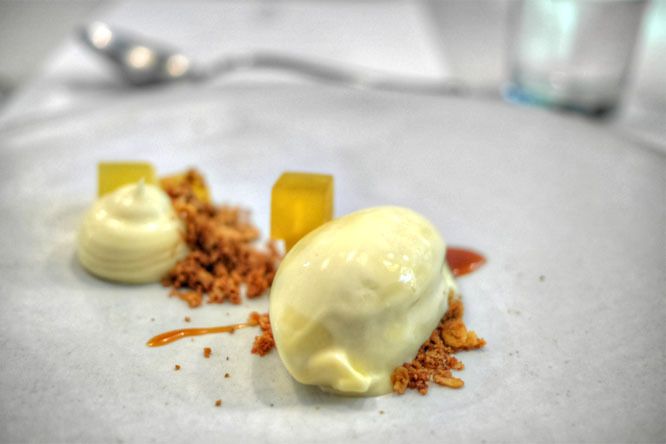 The toasted oat ice cream was superb, conveying an almost cereal-like character to it that I found a surprisingly potent pairing with the fruity, spicy notes on the plate. Very smart, and quite apropos for the holiday season I'd say. 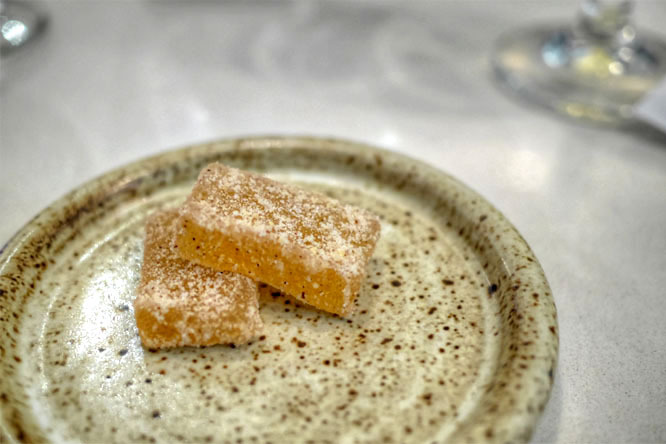 Last up were apple pâtes de fruits with hazelnut sugar, which I found surprisingly nutty, the fruit unexpectedly subdued. What a long way Alma has come. Even from the first pop-up, where we were the only two customers in the place (and there were only two people in the kitchen--now the Chef commands no less than six), I saw something in Taymor that I couldn't quite put my finger on, but I figured that he was one to watch. That was nearly two years ago, and the success he's achieved thus far has probably gone beyond what anyone had imagined, but I gather that the best is yet to come. The cooking here has progressed nicely since my last visit, with the food becoming more nuanced, more multifaceted, with more ambitious flavor profiles and a more progressive edge to it. I'm genuinely excited to see where Taymor takes the restaurant; keep an eye out for sure. Are you gonna continue to use HDR or were you just doing this to try it out? I think HDR makes the food look a little unrealistic. The food pictures with your old camera looked much better than the new ones. I agree with the previous comments. Your old food pictures look better. These look overly processed. Anon x 4: Why do I get the feeling that you're the same person? Chris: Yes, love those muffings. Is this a thinly-veiled advertisement for Marco's? Brian: And go back you will come February. This information should reach more people.